More than 53% of Americans do not have a minimum three-day supply of non-perishable food and water stored in their home at all times. After watching news footage of countless communities being left cut off from the outside world due to hurricanes, floods, and wild fires in 2017 alone, it is simply shocking that EVERY single American hasn’t devoted at least an entire closet for the storage of long-term survival food, water, and emergency first aid supplies. As the social unrest in the United States prepares to hit a fevered pitch not seen since the Civil War, there is more reason than ever to stockpile long term storage food. Getting caught outside rushing to the grocery store in the midst of a violent riot complete with burning buildings and other acts of lawlessness and looting. It will truly be a survival of the fittest ( and best armed) during a SHTF scenario. A trip to the grocery store in that type of environment could turn deadly very quickly – and the shelves would likely be bare if you were lucky enough to even reach the corner market. Stocking up now shelf stable survival food kits is the only sensible and intelligent decision you could make in an effort to keep both yourself and your family safe when disaster strikes. 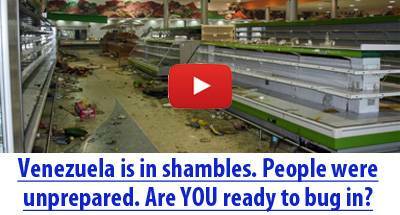 People are going to panic the second SHTF, and will do anything to gather food for their family. If you have stockpiled survival food kits, you can immediately begin bugging in with your family or rapidly move to your bugout location. Mountain House has the longest proven shelf life of 30 years, taste guaranteed. They provide emergency meal kits, pouches, #10 cans, and pro-paks. The 3-day emergency food supply consists of 20 servings for around $60. The 4-day emergency food supply is around $80 and has 28 servings. The 5-day emergency food supply has a total of 37 servings for around $100. Every emergency meal kit consists of breakfast, lunch, and dinner entrees. They also offer a Classic Assortment Bucket and an Essential Assortment Bucket. The Classic Assortment Bucket is the perfect solution for those who want an emergency food supply but lack enough space. This bucket would fit perfectly in your car and provide you with the calories you need to either shelter in place of make a long trek home on foot. You can also fit The Essential Assortment Bucket just about anywhere thanks to it’s compact and stackable size. This bucket contains four pouches each of Rice & Chicken, Chili Mac with Beef, and Spaghetti with Meat Sauce. Mountain House’s pouches range anywhere from $2.99 to $10.99. There are pouches of beef, chicken, pork, breakfast, vegetarian, and sweets! You just add water, wait several minutes, and be ready to devour your bowl of deliciousness in a flash. Speaking of bowl, no dish is required – you can eat straight out of your pouch which makes this a lot more convenient, especially during an emergency. The Pro-Paks are light-weight and compact design which makes it convenient to pack in your “get home bag.” They also won’t expand at high altitude. Each Pro-Pak contains two 1-cup servings of food. The prices range from $5.99 to$7.99. My top favorites are Spaghetti with Meat Sauce, and Chicken Teriyaki with Rice. #10 Can meals include 10 servings. You just add hot water and food will be ready! Lasagna with Meat Sauce, Rice & Chicken, and Chili Mac with Beef are my top three favorites! Wise Foods is very easy to prepare with the only thing you having to do is add water. Shelf life is up to 25 years and they have the highest customer ratings for quality. This brand has a variety of different options for your emergency food supply. The food supply kits come as Long-Term Food Supply, Grab and Go Food Kits, and Outdoor Food Kits. The smallest Emergency Freeze Dried Meat bucket contains 60 servings with an additional 20 servings of rice. Each pouch contains 4 servings to avoid waste. The bucket is designed for you to be able to stack multiple buckets on top of one another and not worry about shelving. There is also a gluten-free version of Emergency Freeze Dried Meat with Rice for about $110 for a total of 104 servings. The largest Freeze Dried Meat bucket is filled with 720 servings with a hefty price of tag. To increase the calorie and nutritional content and enhance flavor, mix the fruit pouches with the pudding, yogurt, or sauce packets. The Emergency Freeze Dried Vegetable bucket has 120 servings for the price of about $150. You can always mix these vegetables with long-term gourmet butter, cream, cheese, and mushroom sauces. Mountain House foods sometimes offers a free sample packet of their long term storage food to new customers. Wise Foods also produces an Emergency Freeze Dried Powdered Whey Milk survival food it. It consists of of 120 servings for about $90. Each pouch can be re-hydrated in minutes just by adding water!.You can enjoy drinking the milk while eating one of your delicious long term survival entrees or use it in cooking and baking recipes. You can get 144 servings of Emergency Freeze Dried Powdered Eggs for $150. No refrigeration required and this would taste outstanding with your powdered milk. The last time I ordered this, I wanted to eat breakfast for every meal that day because it was just that good. For a 7-day supply of 52 servings of four entrees, two breakfasts, and two beverages, it is $89.99. Freeze Dried Camping & Backpacking Food Favorites from Wise Company is $59.99 for 12 servings of entrees and 6 servings of breakfasts. Wise Foods also offers “camping food” in cases of six. My absolute favorite has always been Alfredo with Chicken. The is the first packet of survival food I ever tried. I made it in the pouch as directed, then poured it into a cook pot to fool my picky eater teenager daughter into trying it – fettucine chicken alfredo is one of her favorite dishes. My finicky girl wanted seconds and then asked for a third helping, before I told her she had just eaten long term survival food. The long term survival food company’s 3-month kits designed to feed a family of four at 3 servings per day for about $2,212.99. Wise Foods sometimes offers a free sample of their long term storage packets, as well. Legacy Premium meal packages are designed to provide a 2-to-1 ratio of lunch/dinner to breakfast. There are more than 19 entree options and 4 delicious breakfast items to choose from. Legacy offers a 16 serving family entree sample pack (about $40 each) and 16 serving breakfast sample pack – also about $40 each..
For about $175.00, Legacy offers a 60 serving bucket of breakfast, lunch, and dinner. You will receive 4 different breakfast meals and 10 different dehydrated lunch/dinner entrees – that is nearly three weeks’ worth of dehydrated breakfast, lunch, and dinner. My three favorite meals from this combo bucket are the pancakes pouches, Italian pasta with marinara, and stroganoff. A free shipping offer is usually offered by Legacy Survival Foods on domestic orders. Not only does Food 4 Patriots offer 25 year life, NON-GMO, and delicious “disaster-free” food, but they also donate a portion of the proceeds to charities who support our veterans and their families. Food 4 Patriots sell 1-Week Food Supply, 4-Week Food Supply, and 3-Month Food Supply. The 1-Week Food Supply is about $70 for 40 servings. The 4-Week Food Supply is approximately $200 for 140 servings and free shipping. For only about $500, you can get the 3-Month Supply which contains 450 servings, free survival tool, free seed vault, and free shipping! Augason Farms has food storage kits, soups, entrees, fruits, vegetables, dairy, meat, protein, grains, and beans. The 30 day food storage emergency food supply is about $140 for 307 servings of food and has a shelf life of 30 years. This supply consists of nutritionally balanced entrees, soups, dry powdered milk, breakfast, and fruit snacks. My all-time favorite survival product that Augason Farms provides is their cheesy pizza kit. It may not be the most healthiest choice, but it surely is one of the most scrumptious! Last year during a power outage over the winter, I decided to make this for supper and my husband could not get over how good it was or that it was considered prepper food. Augason Farm’s Pizza Bucket comes complete with pizza crust mix, sauce mix and freeze dried mozzarella cheese – and makes 12, 10 inch pizzas. 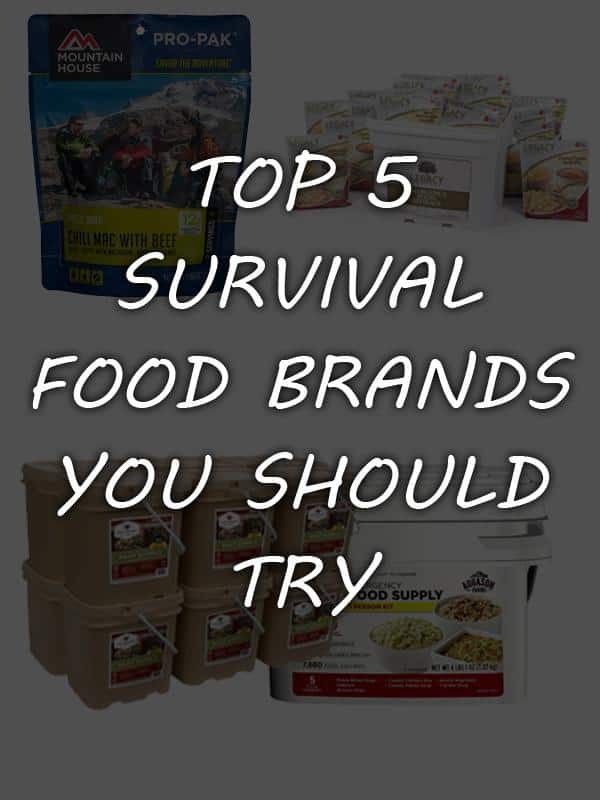 Whichever survival food brand or kit you go with, you will not be disappointed. . Have you tried different survival foods? Share your experiences below. Michael, that is a very good question. I believe Thrive and Wise both offer low carb long term storage meals. I will do a bit more research on this and post an update here in the comments section. My mother-in-law has diabetes, I should be stockpiling more meals for her. We can a lot of food that she can eat, but we definitely should invest more into backup long term storage meals that a person with sugar can safely consume. Have you tried Lindon farm survival food. Comes in buckets with 90 servings, 2000 calories a day for 1 week. Breakfast is oatmeal, polenta and rice pudding. Entrie are western chili, hearty potato soup, red beans and rice, beef flavored veg stew, chicken flavor veg stew and cheddar broccoli soup. Food for patriots offerings are only 1000 calories a day and maybe be great if you are not having to work hard or walk, but 1000 calories will not last long if you are expending energy. I have food from both companies, also Mountain House pouches and 2400 cal food bars for BOB. Cynthia, I have heard of Lindon Farm but have not purchased any. It looks like they have a lot of variety and their prices seem reasonable as well. Have you tasted any? Not that any of us will be picky about taste during a SHTF situation, but just curious from an overall quality standpoint. Thank you for mentioning them! If you are in a survival situation the last thing you are going to worry about is carbs or sodium! My favorites are hands down, Mountain House , Thrive and Augason Farms. Not a fan of Wise foods, we gave the ones we bought away after trying them. But I do have some of all the others that are listed plus a few others. We had some buckets of WISE food storage — when we moved to Central America we brought those with us, but sold all our other food storage. Since they were in nicely packed buckets we were able to “sneak” them in the country. We moved back about 20 months later. And before we moved, we figured we’d eat them. Well, their tortilla soup was so disgusting we couldn’t eat it. My dog wouldn’t even eat it so we left it outside our house so the street dogs would eat it — they were starving, right? So we figured they’d appreciate it. The starving street dogs wouldn’t even touch it. That doesn’t bode well for their food in a survival situation. They did have a few other meals that were edible, but none that were good. Mountain House does taste the best, but it is expensive. So for bug out bags I think Mountain House is the best bet… because it is for short term. For long term, buy individual ingredients, freeze dried, dried and dehydrated, so you can make your own meals. Or use a Harvest Right freeze dryer (there are issues with that, too, because it takes a lot of electricity, time and maintenance…. the first 4-5 months of having one I used it all the time, but now it is a burden to me). Anyway, that is my first hand experience. Rebeccas, thank you for all of your insight. If starving street dogs turned their noses up at the Wise food packets, that does not bode well for their taste, not at all. Mountain House is one of the favorites around my survival homestead too – even with the very finicky loved ones. I definitely agree about making your own shelf-stable food as well. We water bath and pressure can a lot of food from our garden and meat and dairy from our barnyard. I have gotten especially good at dehydrating sour cream – Mason jars containing it will be reserved for a SHTF treat I MIGHT share with others. I have toyed with the idea of investing in a Harvest Right freeze dryer, but just haven’t been able to get myself to click the button and buy yet. I would think it would pay for itself over time, but yes, the electricity sucking they cause would have to be factored into the overall cost. Judy, My family really seems to like Thrive and Mountain House really well too. We have used Augason Farms less, but it seem of really good quality and typically the most affordable. I am not fond of the concept of “simmering for 20 minutes” Food4Patriots directions call for in a survival situation, but if there is power (or propane) their food is tasty. Cass, my hubby loves Mountain House stew as well! You are exactly right, spend a little bit on sample packets now to avoid a lot of regret later. During SHTF, we will eat whatever we can, I will even eat fish – which I have never had in my entire life because it falls into the “looks gross, smells gross” category in my mind – but there is no reason to waste money on something that tastes nasty when you can spend the same amount, or less, to get something that tastes yummy. A big bowl of Mountain House beef stew will easily serve as a morale booster for my hubby during a doomsday disaster! It is imperative that you try what you purchase. I recently bought a supply of emergency food, from one of the companies listed at the Top 5. It was easy to prepare and tasted really good. However, due to health issues, I was unable to tolerate the food. If I had waited until an emergency happened, I would have been in a bad way. I have no problem with the company and planning future purchases from this company, just not the food. That is a great point. I did not think about health issues certain types of food could cause either due to preservatives used, food allergies, or sugar salt content. Waiting until the SHTF to try food, gear, etc. is just never a good idea. I hope you found a long-term food provider that offered meals which did not cause you any health issues.